A well-designed puzzler that will tickle your funny bone. You'll find plenty of shenanigans in Bucketz, a personality-driven game of balance from Picnic Hippo Studios. 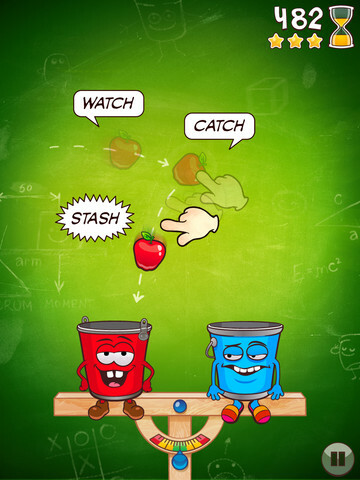 At its core, this fun and challenging iOS title forces you to prevent a bunch of snarky, tough and at times clueless buckets, otherwise known as The Nine, from tipping over by tossing objects into their bottomless containers. That said, the tricky levels, enjoyable gameplay and excellent presentation go a long way to making this one of the freshest mobile efforts around. What makes Bucketz so entertaining is the colorful banter that ensues between The Nine, as well as the announcer, who walks players through the game's intricacies. There's a ton of humor in this iPhone and iPad puzzler, as characters routinely break the fourth wall by making the player a part of the discussion. Granted, users can't respond in any meaningful way (calm down, this isn't Seaman), but it's hard to hold back a chuckle when one bucket explains "Ooh, a player" upon booting up the first level. There's so much charm on display that it practically oozes from the device's speaker holes and headphone jack. Thankfully, there's more to this game than funny buckets and impressive voice acting. The goal is to catch (in mid-air) and then drag a whole mess of different objects into the buckets to maintain balance, and it's anything but easy. Players must possess a basic understanding of weight to know that, yes, a bowling ball is heavier than a volleyball, or that a severed hand (we're dead serious) is lighter than a bushel of apples, because once that beam starts tipping, it's quite difficult to change momentum. That is, unless a Radiating Ying Yang power-up appears. Press it, and all will be right in this virtual world, at least for a little while. While on the subject of items, you can use these to gain the upper hand, whether it's a stopwatch that slows time or a Bomb Defuser that disarms dangerous explosives. Players earn these things normally, or buy them using virtual coins, amassed from simply playing Bucketz or grabbing more via in-app purchase. That said, we love the fact that gamers can play this title from start to finish without spending more than the $1.99 asking price. 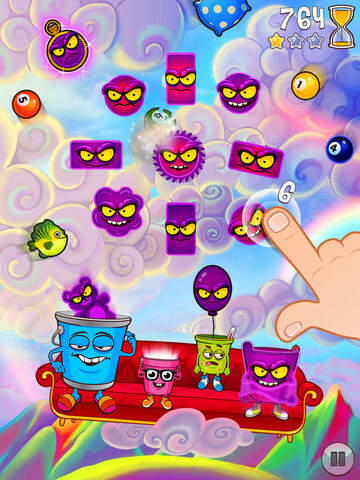 Throw in evil minions, boss fights and plenty of colorful eye candy, and Bucketz is one of the more intriguing games for smartphones and tablets, a smartly designed and cool puzzle experience that packs a solid challenge while offering up hijinks along the way. An essential pickup, indeed. What's Hot: Silly banter between characters, respectable voice acting, tricky stages, a seemingly endless supply of items to throw into those colorful buckets, in-app purchase is available but not necessary to finish the game. What's Not: This brand of humor will not be for everyone.